No cracked/chiseled stained glass bricks? Stairs will come as soon I learn how to code them in. Cracked/chiseled stained are coming very soon, haven't made the textures, but they are easy. Not exactly sure what you mean by metadata/damage, but Stained variants use metadata. Also there will be a config option that allows you to decide whether or not the blocks drop when you break them. It will drop them by default. Mod Has Officially Been Updated!!! +Added config option that allows you to set whether or not bricks are returned on destruction. (Default returns them)"
For stained glass bricks, you could look for Forestry's stained glass, and use that, then, if it can't find Forestry, use normal glass bricks + dye = stained glass bricks. Very useful for advanced builders! Nice spotlight! Added to OP. Glad you enjoy the mod. With no crafting recipes for the stained glass, I guess this is still mostly just a creative mode mod. The only problem is, stairs need metadata for different directions, so I can't use metadata for textures, meaning each color will take up its own block ID. Since I'm making them with 3 different blocks, there will be 48 more IDs added... Could that be a problem? I don't think so, I think that this will make creative mode easier instead of making the items, you can click the color you want. That's not the issue I was addressing. In v1.0.1, only 6 block IDs are used. The colors come from metadata. I can show metadata blocks in the creative menu. The issue I was addressing was the fact that Stairs use metadata for direction, so I can't use it for color, meaning 48 IDs will be added. That's my main thing, jumping from 6 block IDs to 54 block IDs. It could cause some mild compatibility issues. Thanks. Found the list you were referring. Down side is, I will be changing the default BlockIDs in my mod, meaning people who have created awesome builds with the blocks already will either have to create a new world, or change the BlockIDs in the config to what they were prior. With this helpful bit of info, v1.0.2 will be up soon. No official date is set, but I'm aiming for early this week (With any luck, later today or tomorrow). Then you can add this to your server. That recipe for color is for the 1.02 update I take it. Indeed, you can check the OP for "Objectives of Future Updates". I've decided to go with Option B of the choices above. v1.0.2 should be finished tonight and uploaded upon completion. Keep your eyes open for it in the next couple of hours. Putting on some finishing touches. v1.0.2 is LIVE!!!!!! Download it now, thank me later. You can finally play this to the full extent in SSP and SMP! Recipes for Stained Glass Bricks are here! What are you waiting for? Get crafting! The first one is straight-forward enough and has less of a chance of interfering with existing recipes. 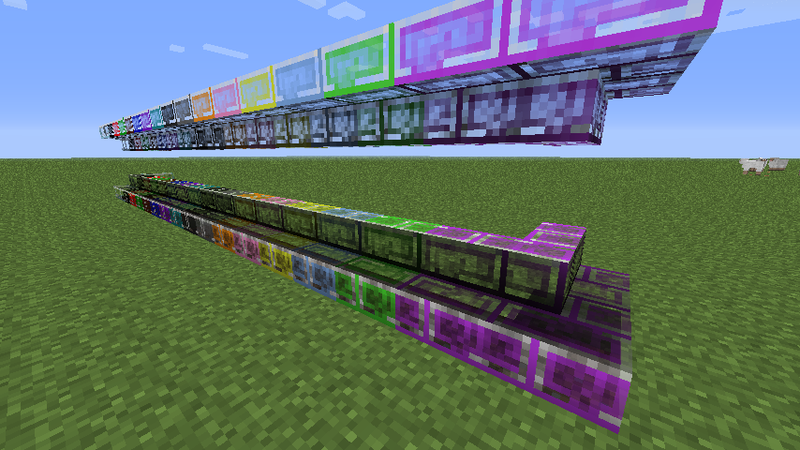 The second one however would shorten an autocrafting factory chain by one station.. perhaps add both? -edit- I can't read, didn't even see the third page of the topic haha. Thanks for the release! If at all possible, please make glass doors and stairs for fantasy gardens (not everyone likes to kill monsters). Otherwise, maximum amount of diamonds! I'm getting scads of ideas for castles and temples already! Stairs are already in (I should probably put a pic up on the OP...) Doors, torches, and possibly beds are planned.